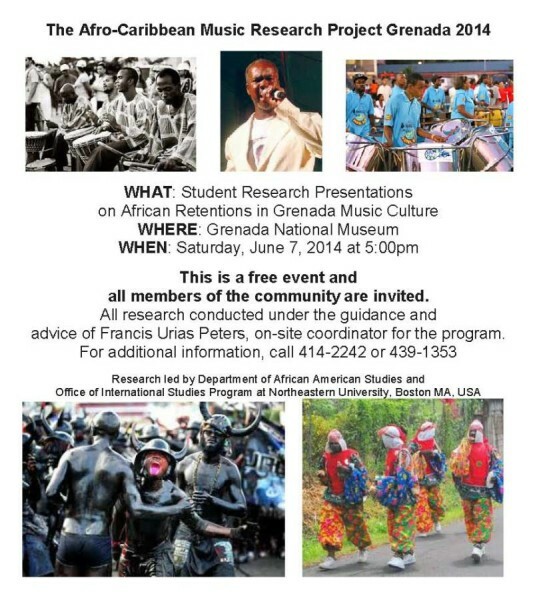 Student research presentations on African Retentions in Grenada Music Culture will be presented at the Grenada National Museum, tomorrow Saturday 7 June at 5:00pm. The research was led by Department of African American Studies and Office of International Studies Program at Northeastern University, Boston MA, USA, and conducted under the guidance and advice of Francis Urias Peters, onsite coordinator for the programme. For additional information, call 414-2242 or 439-1353. This is a free event. All are welcome.